What is it? 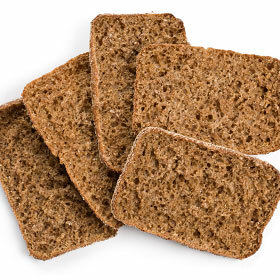 Rye is a whole grain probably most associated with traditional rye bread or pumpernickel bread. Its origins may be traced to parts of Europe and Asia, where it was at first regarded as a weed. But it is thought that at some point during the Iron Age, rye became a hardy crop - and a hearty food staple - for many, who ate it in the form of breads, crackers, and hot cereals. What is it good for? Lucky for us, rye is a stubborn super-grain. Due to how tricky it is to separate and refine rye, it maintains high levels of nutrients. A 100-gram serving of rye contains 15 grams of fibre (over half of what you need in a day) and 15 grams of protein (one-third of your daily needs). Rye is also a rich source of many vitamins and minerals, including B vitamins, iron, and magnesium. Rye should be avoided by those following a gluten-free diet. What does it taste like? Rye has a dense texture and a hearty, rich, and - at times - bitter flavour that makes it an acquired taste. Bulk up baked good recipes with rye flour. Swap white bread for rye. Rye flakes can be cooked and enjoyed like oatmeal, while the "berries" of rye can be a substitute for rice. Store rye in an airtight container placed in a cool, dark, and dry spot in your pantry.